Having graduated from Oxford University in 1994 with a First Class Honours Degree in Medicine & Surgery, Dr Paul Belt completed his basic general surgical training and obtained his FRCS(Eng) in 1998. His Advanced Training in Plastic and Reconstructive Surgery was completed in Brisbane where he spent two years at the Princess Alexandra Hospital, one year at the Royal Brisbane Hospital, and a further year at the Mater Hospital. He then completed an additional year of training as a Fellow in Plastic & Reconstructive Surgery in Oxford. He also completed a fellowship in Oxford after obtaining his plastic surgery qualifications from the Royal Australasian College of Surgeons. Dr. Paul Belt has completed extensive training in Plastic, Reconstructive and Cosmetic surgery. After completing six years of basic medical and surgical training at Oxford University, he spent a further ten and a half years training to be a consultant in Plastic, Reconstructive and Aesthetic surgery. Dr Belt has been a Consultant since 2005. 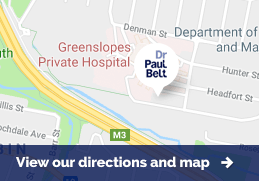 Dr Belt is currently a Visiting Specialist at the Princess Alexandra Hospital, Greenslopes Private Hospital, Brisbane Private Hospital and the Pacific Day Surgery. His specialist interests are: breast surgery (augmentation, reduction, mastopexy or breast lift, breast asymmetry, tuberous breasts and reconstruction), body contour surgery (e.g. after massive weight loss, abdominoplasty and male gynaecomastia reduction), labioplasty, facial rejuvenation surgery (inc. MACS facelift, rhinoplasty, blepharoplasty and fat grafting), treatment of skin malignancies and scar revision). B.A. (First Class honours) Physiological sciences Oxford University, 1991. B.M., B.Ch. Oxford University, 1994. FRCS (Eng.) Fellow of the Royal College of Surgeons of England, 1998. FRACS (Plast.) Fellow of the Royal Australasian College of Surgeons, 2005. ASPS Member of the Australian Society of Plastic Surgeons. Member of the Queensland Chapter of Australian Society of Aesthetic Plastic Surgeons (ASAPS). AMAQ Australian Medical Association – QLD branch. Honorary Secretary of the Queensland Chapter of ASPS (2012-2014). President Queensland Chapter of ASPS (2014-2015). Scientific Convenor for Plastic Surgery Conference (ASPS and ASAPS 2011). Reviewer for the British Journal of Plastic, Reconstructive & Aesthetic Surgery (BJPRAS) since 2004. On the National Medicare Benefits Schedule (MBS) for assessment and on the review consultation committee for the assessment of the item numbers to be used through Medicare for vulvoplasty and labioplasty. Breast surgery - augmentation, reduction, lift or mastopexy, tuberous breasts, breast asymmetry, chest wall correction and reconstruction. Skin cancer surgery - including sentinel lymph node biopsy for melanoma. Cosmetic Surgery - facial cosmetic surgery including the minimal access (MACS) facelift, rhinoplasty, blepharoplasty, fat grafting and abdominoplasty. Body Contour Surgery - especially after massive weight loss. Microsurgery - Reconstruction of the breast, head and neck, soft tissue coverage of the limbs. Australian Society of Plastic Surgeons Hospital Trainee Plastic and Reconstructive Surgery Accreditation inspector from June 2015. Curriculum revision working group for the Royal Australasian College of Surgeons and the Australian Society of Plastic Surgeons collaborative in the delivery of surgical education and training program in Plastic and Reconstructive Surgery from January 2016.